Smart consumers know that the best deals in mobile right now are SIM-only plans, as they tend to give you a lot more data, and often at a lower monthly cost. It does mean that you have to buy your phone without a subsidy, but it also gives you the flexibility of changing your phone whenever you want (as opposed to waiting until you’re due to re-contract). 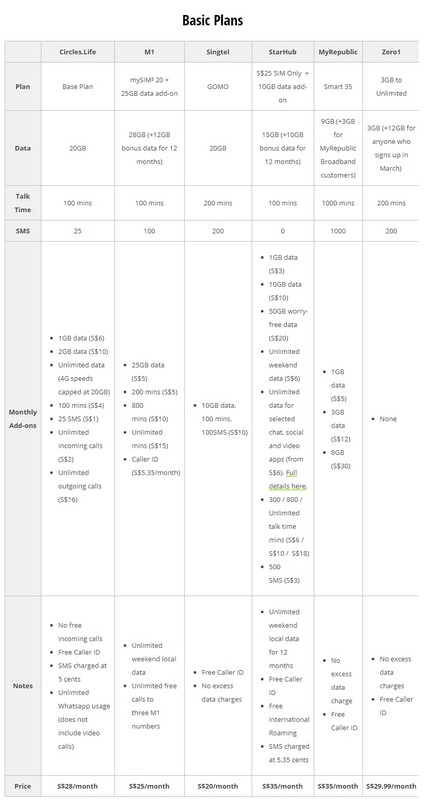 Additionally, while some telcos offer SIM-only plans with 12-month contract periods, it doesn’t make sense to lock yourself into one of these, as telcos are constantly updating their SIM only plans with better and better packages, or in the case of StarHub, completely overhauling their SIM only packages. Keeping yourself to a no-contract plan gives you the freedom to jump to the best deal as soon as it becomes available. A lot of these new plans also give bonuses for being one of the first customers to sign up, so you don’t want to be stuck waiting out your existing contract before switching providers. But who’s offering the best deal SIM-only, no contract plan right now? We find out based on various price tiers. The cheapest deal here is obviously Circles.Life’s S$0 Flexi Plan. However, unless you’re a very low usage customer, you will probably have to top up for some additional services, and the add-on options are actually quite expensive. Additionally, it’s worth noting that incoming calls are not free on Circles.Life, so if people call you frequently (which includes anyone you don’t know, like telemarketers), you’ll quickly burn through your 30 mins of bundled talk time. Topping up for additional talk time is also quite expensive, at S$5 for just 30 mins more. The overall best deal here is Singtel’s new GOMO plan (GOMO stands for Get Out More Often), which gives you a massive 20GB data, and the most amount of talk time and SMSes for just S$20/month. The overall best deal here is once again Singtel’s new GOMO plan, which gives you a massive 20GB data, and a generous 200 minutes of talk time and 200 SMSes for just S$20/month. If 20GB data isn’t enough, you can top up an extra $10 for another 10GB data, 100 minutes talktime, and 100 SMSes. If you want the most data, the best deal is M1’s mySIM³ 20 plan with a 25GB data add-on. This gives you a whopping 40GB (3GB+12GB+25GB) all for just S$25/month. Once again, the best deal is Singtel’s new GOMO plan, which has a base price of S$20 and gives you 20GB data, 200 minutes, and 200 SMSes. But if you buy two S$10 add-ons, you get 40GB data, 400 minutes, and 400 SMSes, all for just S$40/month. 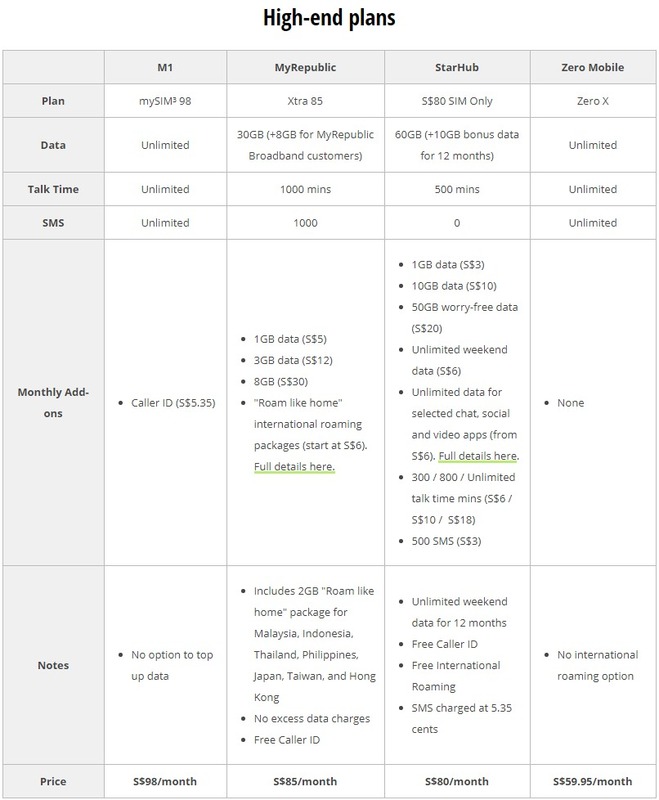 Alternatively, if you value data over minutes, you can consider StarHub’s S$25 SIM Only plan and add its S$20/month 50GB with worry-free data add-on. For this combo, you get 63GB data (3GB + 50GB + 10GB bonus) for S$45/month, though just 100 call minutes. 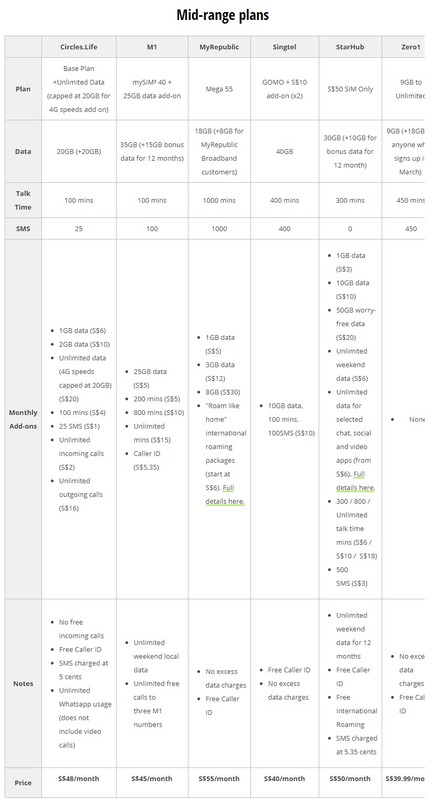 StarHub’s 50GB worry-free data add-on lets you continue to use data for free even if you’ve burst your cap. M1’s mySIM³ 40 with a 25GB data add-on package (S$5) also offers good value with 50GB total data for S$45/month and includes 100 SMS but only 100 minutes talk time. The cheapest and best value deal in the high-end tier is Zero Mobile’s Zero X plan. For significantly less than all of the other plans, you get truly unlimited data, talk time, and SMS, with no data caps or any throttled speeds. The only drawback to Zero X is that Zero Mobile doesn’t offer any international roaming add-ons. 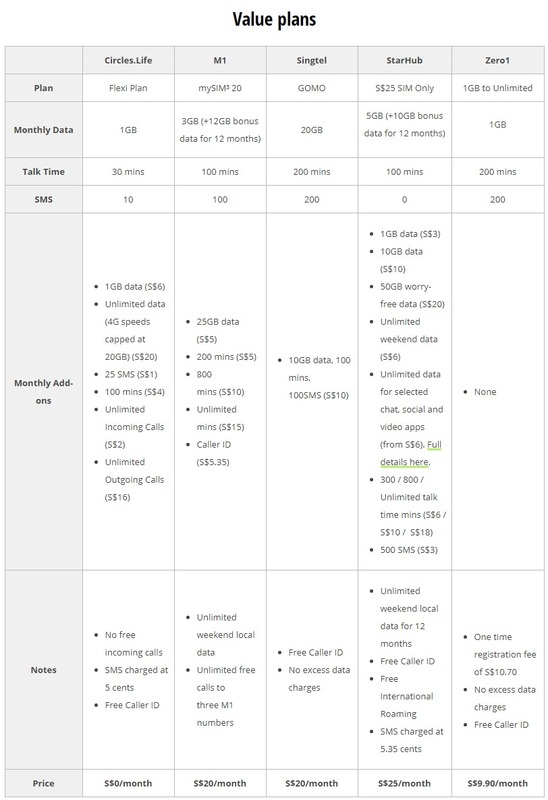 For a more all-rounded plan and from an established telco provider, StarHub’s new S$80 SIM Only plan has a lot going for it, even if you need to consider adding on extra talk time and SMS. Note: Both Singtel and M1 offer other SIM-only plans with more generous data packages, however, they require a 12-month minimum contract period, and considering the current market climate, we do not recommend signing up for a contract right now. As such, we have not included them in this article. If you’re interested in seeing them for yourself, check out Singtel here and M1 here.